"Oh, what sighs I uttered, what tears I shed, to mingle with the waters of the torrent, while I chanted to Thee, O my God, the psalms of Holy Church in the Office of the Dead!" HE BEST AGE to administer the Sacrament of Confirmation is a matter of discussion in my diocese, as it is in many others. There are advocates for quite a wide range of ages, from as early as Baptism to the latter years of high school. Reasonable arguments can be made in favor of almost any age between these two mileposts. But which age is best? Anyone involved in Catholic education/catechesis will know the struggle it is to keep young people in religious education after their Confirmation. A common tactic in many local Churches has been to raise the age at which Confirmation is administered to high school, on the theory that doing so will keep students in religious education for a longer period of time. In my locale, the norm is to confirm students in sixth grade, and the result is that most parishes offer no formal religious education past sixth grade. In those parishes that do offer a program beyond, there is often a significant drop-off in attendance post-Confirmation. The Sacrament of Confirmation—what is this Sacrament called? Confirmation? No! Its name has changed: the ‘Sacrament of farewell.’ They do this, and then they leave the Church. . . . Many young people move off after receiving Confirmation, the Sacrament of farewell, of goodbye, as I said. It is an experience of failure, an experience that leaves emptiness and discourages us. Is this true or not? 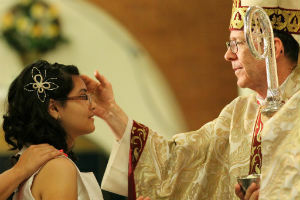 In addition to the issue of becoming the “Sacrament of farewell,” Confirmation has also come to be understand by many people (clergy & catechists, included) as a sort of Catholic Bar/Bat Mitzvah—a young Catholic’s personal acceptance of the faith into which he or she was baptized. Confirmation, however, immediately followed Baptism (even with infants) for many centuries in the West, and this practice continues in the Eastern Churches even today. Thus, the understanding of Confirmation as an adult acceptance of faith cannot be true without also claiming that the long tradition of the Church’s liturgical practice was errant. Equating Confirmation with a personal acceptance of faith is a fundamental misunderstanding of the Sacrament, which is better understood as the strengthening of the Gifts of the Holy Spirit received at Baptism. Having said all this, what is the best age for Confirmation? ET ME ANSWER by way of analogy. In Pennsylvania, young people must be 16 years of age in order to obtain a driver’s license. At what age do the most traffic accidents occur? Not surprisingly, at age 16. We must, therefore, raise the driving age to 18, some say. But, if we do that, at what age would the most traffic accidents occur? I suspect, at age 18. If we raised the driving age to 35, I daresay that most traffic accidents would occur at age 35. Pushing Confirmation back later and later, I believe, simply perpetuates the conception of this Sacrament as the proverbial carrot being dangled in front of the student. If young people are giving up on religious education (or religion altogether) after Confirmation in sixth grade, what makes us think that moving the age to eighth grade or high school will make any difference? For this reason, my opinion is that Confirmation would be better restored to its original position, before Holy Communion. So long as Confirmation is treated as the carrot to be obtained by the student who sticks around long enough, it is destined to be treated as “graduation” (the corollary to which is subsequent disappearance from parish life). The subliminal understanding of Confirmation as graduation is well entrenched, and I believe the only effective means of counteracting this understanding will be a total disruption of “the system” as it now exists in many dioceses. “The system” consists in hopping on a conveyor belt at Baptism, riding it until Confirmation, and jumping off forever thereafter. Perhaps if we confirmed our young Catholics at some point between Baptism and First Holy Communion, we could reclaim the sense that religious education is not mere Sacramental preparation, but also formation in discipleship. IS EXCELLENCY, Bishop Larry Silva has proposed the restoration of the traditional order of the Sacraments of Initiation in his Diocese of Honolulu. In an article for the Hawaii Catholic Herald, he offers a very cogent explanation for this decision. I encourage you to read his article. It details a well-considered pastoral plan for practically implementing the transition. As the bishop explains, “Current practice is like counting 1, 3, 2,” because Baptism & Confirmation “go together like Easter and Pentecost.” There is an inner logic to the traditional order of the Sacraments that is totally lost when Confirmation is pushed to adolescence. Baptism is the gateway Sacrament; Confirmation seals & strengthens the gifts first received at Baptism; and Holy Eucharist is the pinnacle toward which all Christian initiation tends. Not only is Baptism, Confirmation, Communion a restoration of the long tradition of the Church, but I believe it is also a very pastoral solution to a problem being faced in many communities. Instead of simply delaying students’ departure from religious education programs, it stresses the value of catechesis on its own, independent of Sacramental preparation. It also serves to remind parents that they must be the first & best teachers of their children in the ways of faith. There will be no magical cure-all to the issues of catechesis. But restoring Confirmation to its proper place might be a start. The image at the top of this post is a photo of Bishop Thomas J. Olmsted, the Bishop of Phoenix, administering the Sacrament of Confirmation. 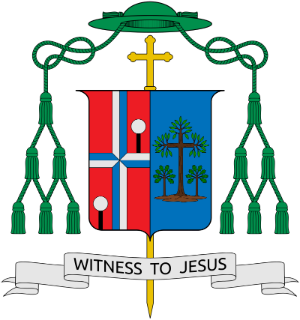 After this post went live, I learned that Bishop Olmsted several years ago took the same step that Bishop Silva is now taking (hat tip to Matt Meloche—thanks!). There is a fascinating explanation of Bishop Olmsted’s decision from 2005 available HERE.